Fire. Flood. Storm Damage. Natural disasters like these can cause incredible amounts of damage and many homeowners want to restore the damage as quickly as possible following a natural disaster. Unfortunately, in an effort to repair damage, many well-meaning homeowners often do more harm than good. Worrying about natural disasters keeps many people up at night, and perhaps with good reason. 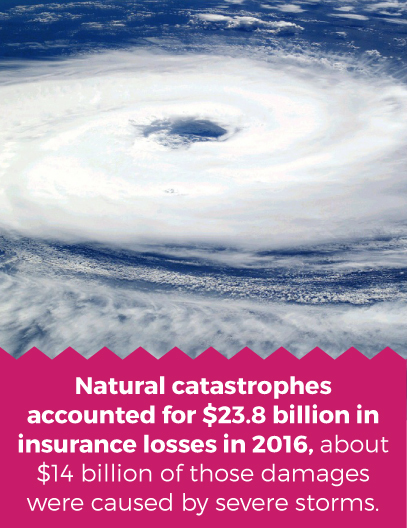 According to the Insurance Information Institute (III), natural catastrophes accounted for $23.8 billion in insurance losses in 2016, a sharp rise from the $16.1 billion a year earlier. About $14 billion or 60% of those damages were caused by severe storms. Floods came in at $4.3 billion while tropical cyclones and hurricanes accounted for $3.5 billion. However, note that these numbers don’t even include damages caused by house fires (except for those caused wildfires or lightning strikes.) III also has numbers on fire damage, noting that in 2015, a department in the United States had to respond to a fire on average every 23 seconds, with property damages exceeding $21 billion. So if something like this happens to you and your home, what are you supposed to do? While your primary concern should always be to your loved ones, making sure that they are safe, and with some preparation, you can also help minimize property damage and ease recovery. The fear of fire plagues every homeowner. This is one of the reasons why smoke detectors are found in every household and other safety measures are included in electrical appliances to help prevent electrical fires. Unfortunately, while measures like these have drastically reduced the risk of home fire, they have not eliminated it. If you have a fire or smoke damage in your home, there are certain steps you should take, regardless of how serious the fire is. The safety of you and your family should always be your primary concern. In the event of a fire, your first step should always be getting your family, and pets if possible, out of the home and far enough away that they are no longer in danger. Even if it is a small fire — such as a grease fire in a pan or something burning in your oven — staying in the house and trying to extinguish it yourself can be dangerous. If you feel confident that the fire has been contained and put out, do not just re-enter your home. Get permission from first responders first. Remember, fires can cause structural damage, so while you may no longer be in danger our getting burned, portions of your home may still be structurally unsafe. You don’t want to use utilities in your home before having them professionally inspected. A damaged utility may cause a secondary disaster even more dangerous than the first. So turn off your gas, water and electricity until they can be inspected by professionals. Make sure to let the company or professional know exactly what happened so that they know what to look for during their inspection. Next, you want to make an initial inspection of the damage. This information will help the insurance company assess damages and will ensure that you get the money that you should for replacing damaged belongings. 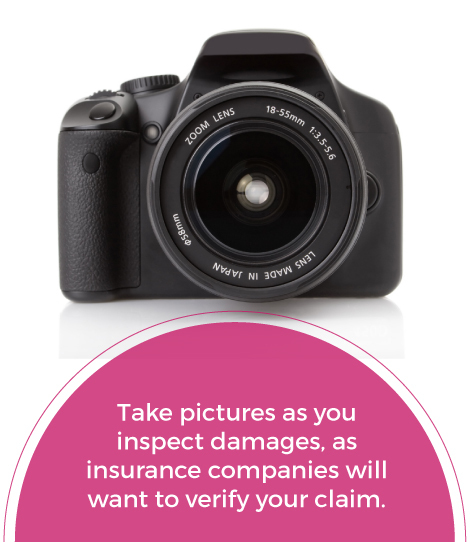 Take pictures as you do it, as insurance companies will want to verify your claim. As more people begin to get to work restoring your home, they will inevitably disturb the scene and remove items that have been destroyed, so you want to make sure that you have photographic evidence of everything that has been damaged. Now that you have everything documented, it’s time to start bringing in specialists to help you get your home back to looking like new. Trying to do the restoration work yourself is a bad idea. You can help by vacuuming, as this will remove superficial dust, debris and soot. However, there are many contaminants that can damage your home during a fire, like smoke and soot. A restoration professional will understand how best to treat these. Do not try and clean soot covered walls and ceilings yourself. Unfortunately, the thin particles in soot and smoke will more likely spread if you approach them using standard home cleaning equipment. Leave that kind of work to a pro. Because of the number of contaminants and chemicals that are released into the air during a house fire, it is not safe to eat anything that remains in your home, whether it’s found in your cabinets or your fridge. So make sure to throw this away, especially before it starts to degrade and add more unpleasant odors to the mix. Depending on the location and extent of your fire, you may be able to use your appliances again after they have been inspected and cleaned by a restoration professional. However, the food that remains within them needs to be thrown away. A lot of different issues can cause water damages. Hurricanes can do structural damage and cause flooding. River and creek floods can cause flooded basements and do extensive damage to the first floor of your home. A burst water pipe may do isolated damage where the leak occurred, yet that damage may be extensive albeit in one particular area. Regardless of the cause, addressing water damage quickly and professionally is essential for effectively restoring your home and making it safe for your family to return to it. There are two consequences of water damage that can lurk in your home unseen long after the precipitating event: mold and hidden structural damage. A lot has been written about the health concerns surrounding mold, especially toxic black mold. 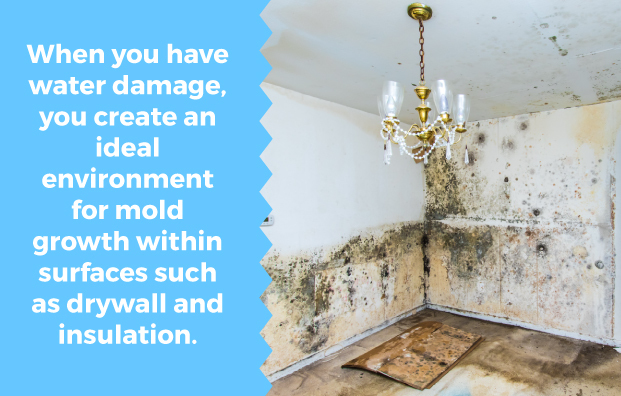 When you have water damage, you create an ideal environment for mold growth on and in materials such as drywall and insulation. However, depending on where the mold is growing, it can be hard to spot. Infected insulation may be found behind a wall that appears undamaged otherwise. You need someone who knows what they’re looking for to give the area a thorough inspection. The same is true of hidden structural damage. A load bearing post or walls may have been structurally compromised. However, the danger of this structural damage may not be realized until much later when things finally collapse. A professional will be able to catch compromises in structural integrity that a cursory visual inspection may miss. Professionally, water damage falls under three categories. Depending on the category, a different restoration approach is required. Moreover, each category indicated an increase in seriousness and risk of health concerns and toxicity. Category 1 water damage is caused by water that is otherwise potable or fit for human consumption. This includes broken supply lines, sprinkler systems, or natural sources like rain water or snow melt. However, this is not to suggest that category 1 water damage cannot pose a health risk. Water, once out of its proper container, can start to cause mold growth or, if left untreated, become infected or otherwise contaminated. So while category 1 water damage may not pose an immediate health risk, it does need to be addressed quickly or it might become a health hazard further down the road. Category 2 water damage is caused by water that is untreated and may cause discomfort or disease in humans. It is often referred to as “gray water.” This is water that has been used for showering or washing clothes. 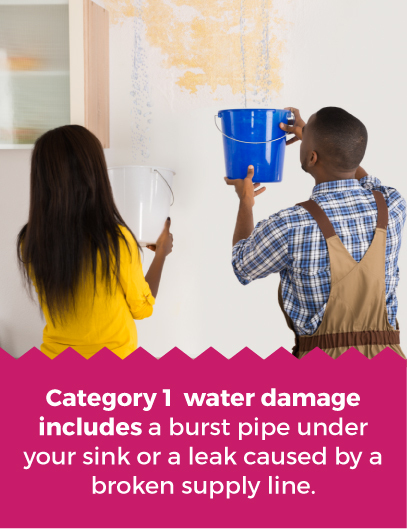 Category 2 damage is often caused by leaking storage tanks. While gray water is not considered dangerous unless consumed, it can contain small amounts of microorganisms. Given the proper conditions, those microorganisms can reproduce and become much more dangerous. Furthermore, it can be hazardous to do category 2 clean-ups by yourself, as many homeowners don’t realize that they are category 2, and therefore approach them as a category 1. However, floodwater is also considered category 3, as it is completely untreated. The horror stories told after Hurricane Katrina, for example, were as bad as they were because the damage was from category 3 water damage. Not only was there extensive structural damage, but the water became a cesspool of disease, making homes uninhabitable for years. Beyond diseases, category 3 water damage may also involve other contaminants such as chemicals, pesticides or heavy metals. Obviously, category 3 water damage must be left to a professional. In the case of flooding, it’s likely the whole area will be considered a disaster area, so there are also legal implications to the clean-up effort, so professional clean-up may be legally mandated and regulated. As opposed to the categories of water damage, which refer to the condition of the water doing the damage, the classes of water damage refer to the kinds of structural damage done by the water, regardless of its quality. Like the categories, these classes will dictate the clean-up approach. Class 1 damage takes place when a minimal amount of water flows onto areas that are not porous. Therefore, little mitigation is required beyond removing water and aiding in evaporation. 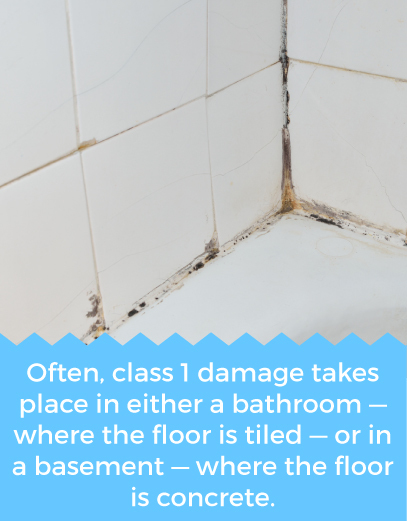 Often, class 1 damage takes place in either a bathroom — where the floor is tiled — or in a basement — where the floor is concrete. Because water cannot penetrate these surfaces, the water just has to be removed to correct the issue. A leaky water tank in the basement or a leaky toilet would cause class 1 damage. However, in the case of a second-floor bathroom, water may have seeped past the tiles and therefore damaged porous surfaces, such as drywall, outside of the bathroom and further steps may be needed. Class 2 damage typically involves the same amount of water as class 1 damage, except that the surfaces affected are more porous that tile or concrete. A common cause of class 2 damage is a burst water line behind drywall. Class 2 damage requires more aggressive evaporation techniques, relative to the amount of water causing the damage. A professional with experience with this kind of damage will increase your chances of remedying the issue without having to do large-scale costly repairs. Class 3 damage requires the highest level of evaporation as water has soaked highly porous materials. An example would be standing water on top of carpet. High-powered evaporation is essential for mitigating class 3 damage, meaning a professional and professional-grade equipment is key. To be considered class 4 damage, the water not only needs to be substantial, but the structure being affected is constructed in such a way that water removal and drying requires special equipment. Opening up a structure is an important part of mitigating water damage; however, this isn’t possible in a class 4 case. In other words, class 4 is a worst-case scenario, in which the amount of water is significant, the material affected are porous and typical evaporation approaches aren’t possible because of the architecture of the building. So what does it mean to have a professional complete the restoration process? Let’s outline the steps and equipment that make a restoration professional. Because of the potential danger of much of the fire and water damage that restoration professionals have to address, extensive professional training is essential. For example, professionals need to be aware of local and state regulations as well as applicable Occupational Health and Safety (OSHA) rules. This includes training in the wearing of Personal Protective Equipment (PPE). They also need to be familiar with the industry standards. Many top water restoration professionals are IICRC certified, which means that they participate in regular training courses and adhere to strict safety and quality standards. Regular training helps make them well-prepared for any number of uncommon problems. As mentioned, professionals are trained in the proper wearing and employment of PPE. Depending on the category of the water damage, different PPE is required. Failing to use the proper PPE could result in severe illness, skin damage, or even death. By receiving the proper training, professionals will ensure that the job is done without any injury or illness. Moreover, simply having the equipment requires investment. This is another advantage of working with a professional. Because they do this job day in and day out, a professional will have all the proper equipment on hand. While we already mentioned professional safety equipment, there are also many professional tools used in water and fire damage restoration and mitigation. Commercial fire and water damage restoration equipment is crucial for efficient and complete mitigation. Air movers keep air circulating throughout a structure, thus promoting evaporation. They will be employed throughout a structure to ensure fast drying. They are also used during fire restoration jobs as they help to remove smoke and other air contaminants from the building. Air movers come in a variety of sizes, so the restoration team will choose the size that is best suited for the job. For example, the B-Air® Vent VP-25 Compact Air Mover is a compact model ideally suited for smaller rooms or tight spaces. On the other hand, the B-Air® Vent VP-50 Air Mover is a larger air mover that is commonly used for much larger jobs. While air movers keep air circulating, commercial dehumidifiers remove moisture from the air, further accelerating evaporation. While many people use residential dehumidifiers in their homes, especially in the summer, an industrial-grade dehumidifier is standard during water damage restoration. Dehumidifiers work by cooling air and removing the moisture that collects from the condensation. Because cool air is less capable of holding moisture than warm air, the extra moisture has to condense and can then be collected. Dehumidifiers come in two varieties, conventional and LGR (low grain refrigerant) dehumidifiers. LGR dehumidifiers utilize a pre-cooling mechanism to further cool the air, which makes it able to remove more moisture from the air. These models are used in more severe water damage scenarios. 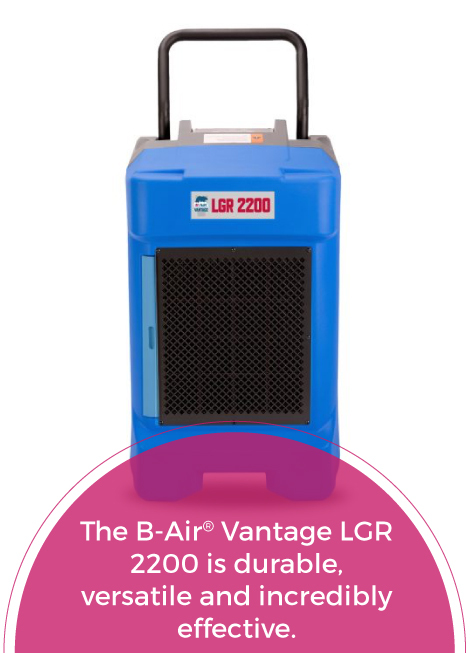 One of our most popular models is the B-Air® Vantage LGR 2200. It is durable, versatile and incredibly effective, as it uses LGR technology and its components are protected by roto-molded plastic housing, making it a must-have piece of water damage restoration equipment. Whether your home has experienced water or fire damage, particulates and odors in the air need to be removed to ensure that your home or building is safe and usable again. Air scrubbers are the tool for such a job. The industry standard for air purification is High-Efficiency Particulate Air (HEPA) filters. These are the most effective filtration methods for removing a wide range of contaminants. They catch not only the particles that can be seen with the naked eye, such as dust and soot, but also those contaminants that are invisible, yet just as dangerous for our respiratory systems. The B-Air® RA-650 Air Scrubber is a highly portable yet powerful air scrubber designed to remove a wide range of particles in the air. They are popular on jobs outside of damage restoration, as they are also effective at removing drywall dust or pet dander. As you can see, damage mitigation is a complicated process. However, stakes are simultaneously very high. If your home has suffered a catastrophe such as severe flooding or fire, it is understandable that you want to repair your home as quickly as possible. Don’t prolong this event’s effects on your life by trying to restore the damage yourself. A professional is the best way to ensure that you will be able to move back into your home and start the process of rebuilding. If you are a professional, you should be partnering with an equipment manufacturer that has experience in the industry that will ensure that you are giving your customers the kind of service that they need to recover from a disaster. We specialize in restoration equipment that is both extremely versatile while also being durable, allowing you to use the same tool job after job without any diminished performance. Furthermore, we provide bulk pricing for our professional customers. For nearly twenty years, we have been putting our customers first, serving a number of professional industries. Whether you are looking to restore water damaged structures, inflate playhouses, dry wet floors, or dry a dog after a bath, our B-Air® has the perfect tool for the job. So if you are looking for more information on our equipment line or want to inquire about bulk pricing, contact us today! You made a great point about natural disasters and how it is important to inspect everything before going into any kind of normal life. It was interesting that you talked about putting Vaseline on chrome trim faucets to clean fixtures after a fire from either a tree or the weather. Thank you for the great informality to keep in mind if something ever happens. Now all I need to find is information on what to do with broken trees for clean up. It really is nice to get a full break down of the different disaster levels and how they can effect a home. I imagine that that can really help with finding the right restoration service for your particular problem. After all, if it is a flood you’re trying to clean up from then you’d probably want the restoration company to know just how extensive the damage is beforehand.